Are You Motivated Yet? - Now That's Motivating! I wanted to catch lightning and bottle it. I wanted something that would make the heart beat and the blood pump with gusto and zeal. I wanted leaping cat, a soaring eagle, a ledge with a view, a snaking jungle river and I wanted a double freakin’ rainbow for added intensity. I wanted something to motivate me for when all other motivational images fall short and I got it! In the run up to Christmas I’ve got my sleeves rolled up extra tightly and am pushing hard for a strong finish to the year. I want to hit 1000 circles on Google + (so you should come circle me) so that next year can start from a 4 digit summit. I want to keep moving forward – and I’m motivated to do so. What are your goals for the end of 2013? 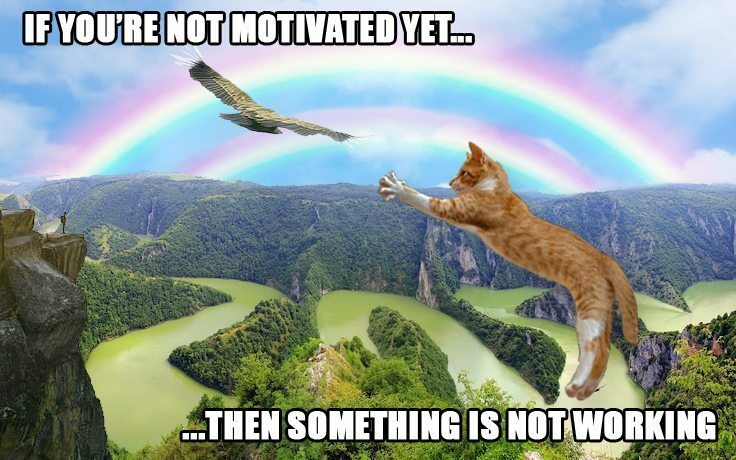 And, are you motivated yet or is something not working? Big thanks to Elena for the graphic design work! 4 Replies to "Are You Motivated Yet?" If you’re happy then I’m happy – cheers Elena! Good luck on reaching your goal, still learning the ropes on g+.